I want to start something new on the blog I’m calling ‘Motivational Monday’ where each Monday you can find a short fun or serious motivational post. Life can be tough and sometimes we feel all alone even when surrounded by friends and family. We might be going through a hard time or are filled with fear and anxiety, maybe even battling an illness; so my hope is that for the time you spend with me on the blog, you feel a sense of purpose, know you are not alone, and I encourage you to take the time to write me via my contact page, I’d love to hear from you. 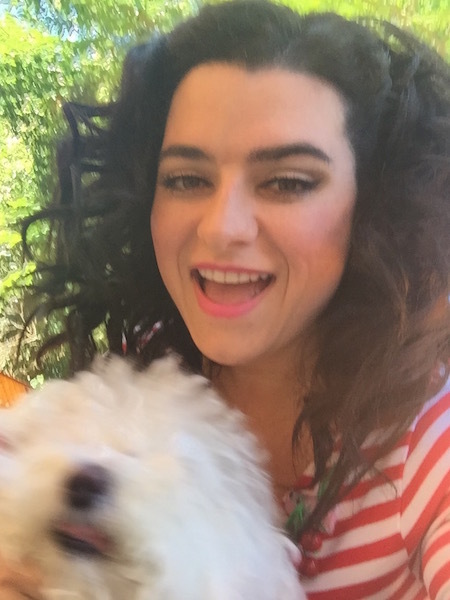 Here is a pic of me and my sweet Luna; a fluffy Bichon Frise dog that is my joy. I snapped a random selfie of the two of us playing in the backyard recently. I was feeling really down and alone that day but looking at this pic you wouldn’t know it as we are playing and smiling, having fun. Did you know that smiling actually has a lot of benefits? When you start to smile, and smile like you mean it, joy spreads throughout your body and you invite a different mind set. Smiling and laughter can have a healing power and just like the old saying goes ‘laughter is the best medicine’ is true. I know it is not always easy, but just try it, when you wake up in the morning, decide your going to have a really great day and that you are going to smile more today than yesterday. Invite joy and happiness today! !